According to data released by NASA and NOAA last week, April was the 13th warmest April globally on record. Here are the data for NASA’s analysis; here are NOAA data and report. The two agencies have slightly different analysis techniques, which in this case resulted in different temperature anomaly values but the same overall rankings. Most months, the analyses result in different rankings. The two techniques do provide a check on one another and confidence for us that their results are robust. April’s global average temperatures were 0.50°C (0.9°F) above normal (1951-1980), according to NASA, as the following graphic shows. The past three months have a +0.53°C temperature anomaly. And the latest 12-month period (Apr 2012 – Mar 2013) had a +0.59°C temperature anomaly. 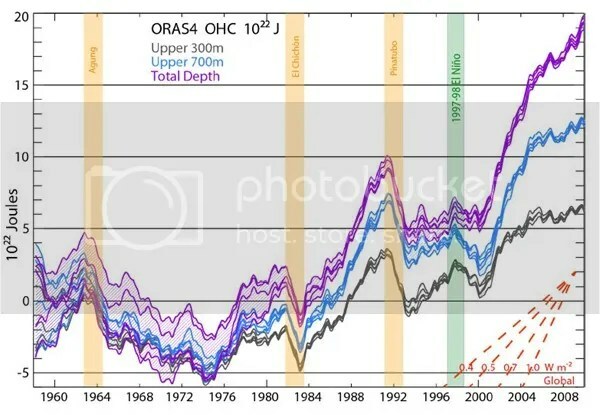 The time series graph in the lower-right quadrant shows NASA’s 12-month running mean temperature index. The 2010-2012 downturn was largely due to the latest La Niña event (see below for more) that ended early last summer. Since then, ENSO conditions returned to a neutral state (neither La Niña nor El Niñ0). Therefore, as previous anomalously cool months fall off the back of the running mean, and barring another La Niña, the 12-month temperature trace should track upward again throughout 2013. Figure 1. Global mean surface temperature anomaly maps and 12-month running mean time series through April 2013 from NASA. According to NOAA, April’s global average temperatures were 0.52°C (0.94°F) above the 20th century mean of 13.7°C (56.7°F). NOAA’s global temperature anomaly map for April (duplicated below) shows where conditions were warmer and cooler than average during the month. Figure 2. Global temperature anomaly map for January 2013 from NOAA. The two different analyses’ importance is also shown by the preceding two figures. Despite differences in specific global temperature anomalies, both analyses picked up on the same temperature patterns and their relative strength. Both analyses show much cooler than normal conditions over most of North America, Europe, and northeast Asia. As I’ve discussed elsewhere, this is in response to the abnormal jet stream. Large, unmoving high pressure centers blocked the jet stream at different locations in the Northern Hemisphere multiple times this winter and spring. The jet stream therefore assumed a high amplitude pattern where the trough and ridge axes were tens of degrees of latitude apart from one another. When this happens, very cold air is pulled southward and warm air is pulled northward (look at central Eurasia). In April 2013, the specific position of the high pressure centers caused cold air to spill southward over land as opposed to over the oceans. These cold air outbreaks were an advantage for the US in that severe storms were unable to form. This situation obviously broke down in the past couple of weeks and we have correspondingly seen devastating severe weather outbreaks across the south-central US. Figure 3. Time series of weekly SST data from NCEP (NOAA). The highest interest region for El Niño/La Niña is NINO 3.4 (2nd time series from top). The last La Niña event hit its highest (most negative) magnitude more than once between November 2011 and February 2012. Since then, tropical Pacific sea-surface temperatures peaked at +0.8 (y-axis) in September 2012. You can see the effect on global temperatures that the last La Niña had via this NASA time series. Both the sea surface temperature and land surface temperature time series decreased from 2010 (when the globe reached record warmth) to 2012. So a natural, low-frequency climate oscillation affected the globe’s temperatures during the past couple of years. Underlying that oscillation is the background warming caused by humans. And yet temperatures were still in the top-10 warmest for a calendar year (2012) and individual months, including through March 2013, in recorded history. We ascribe a certain status to top-10 events. April 2013 obviously missed the top-10 threshold, but it remains close to that level of anomalous warmth. However, the difference in temperature magnitude between the 10th and 13th warmest Aprils is measured in tenths of a degree. Skeptics have pointed out that warming has “stopped” or “slowed considerably” in recent years, which they hope will introduce confusion to the public on this topic. What is likely going on is quite different: since an energy imbalance exists (less outgoing energy than incoming energy due to atmospheric greenhouse gases) and the surface temperature rise has seemingly stalled, the excess energy is going somewhere. That somewhere is likely the oceans, and specifically the deep ocean (see figure below). Before we all cheer about this (since few people want surface temperatures to continue to rise quickly), consider the implications. If you add heat to a material, it expands. The ocean is no different; sea-levels are rising in part because of heat added to it in the past. The heat that has entered in recent years won’t manifest as sea-level rise for some time, but it will happen. Moreover, when the heated ocean comes back up to the surface, that heat will then be released to the atmosphere, which will raise surface temperatures as well as introduce additional water vapor due to the warmer atmosphere. Thus, the immediate warming rate might have slowed down, but we have locked in future warming (higher future warming rate). Paying for recovery from seemingly localized severe weather and climate events is and always will be more expensive than paying to increase resilience from those events. As drought continues to impact US agriculture, as Arctic ice continues to melt to new record lows, as storms come ashore and impacts communities that are not prepared for today’s high-risk events (due mostly to poor zoning and destruction of natural protections), economic costs will accumulate in this and in future decades. It is up to us how many costs we subject ourselves to. As President Obama begins his second term with climate change “a priority”, he tosses aside the most effective tool available and most recommended by economists: a carbon tax. Every other policy tool will be less effective than a Pigouvian tax at minimizing the actions that cause future economic harm. It is up to the citizens of this country, and others, to take the lead on this topic. We have to demand common sense actions that will actually make a difference. But be forewarned: even if we take action today, we will still see more warmest-ever La Niña years, more warmest-ever El Niño years, more drought, higher sea levels, increased ocean acidification, more plant stress, and more ecosystem stress. The biggest difference between efforts in the 1980s and 1990s to scrub sulfur and CFC emissions and future efforts to reduce CO2 emissions is this: the first two yielded an almost immediate result while it will take decades to centuries before CO2 emission reductions produce tangible results humans can see. That is part of what makes climate change such a wicked problem. Categories: environment, global warming, NASA, NOAA, policy, science | Tags: climate change, climate change effects, climate policy, El Niño, ENSO, global temperatures, global warming, global warming effects, La Nina, NASA, NASA temperature data, NOAA, NOAA temperature data, policy | Permalink.